Nearly half of American children aged under five are from an ethnic minority, according to a new report from the US Census Bureau. The latest figures show 45% of US pre-schoolers are non-white, with the Latino population growing the fastest. Of the overall US population, one-third are now from an ethnic minority. The report comes amid a series of huge immigrant demonstrations protesting against tough anti-immigration measures being considered by the US government. In 2005 the minority population was 98 million, 33% of the 296.4 million people in the US, the census agency said. Latinos are the largest minority, now numbering 42.7 million, and the fastest growing, with a population increase rate of 3.3%, the figures show. 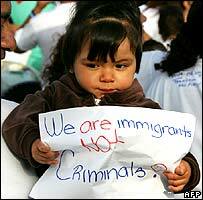 Of the 1.3 million more Latinos than when the figures were last gathered 500,000 were immigrants, the bureau said. Numbering 39.7 million, blacks form the second-largest minority, with a growth rate of 1.3%. The Asian population of 14.4 million grew by 3%, an increase also driven by immigration, with 239,000 of the 421,000 new members having arrived from abroad. American Indians and Alaska natives number 4.5 million and grew by 1%. Native Hawaiians and other Pacific islanders total 990,000, with a 1.5% growth rate. With almost 67% of the overall population, non-Latino whites are still the largest group, but they have an older average age and much lower growth rate, increasing by just 500,000 in the period measured. "These mid-decade numbers provide further evidence of the increasing diversity of our nation's population," Census Bureau director Louis Kincannon said. Immigration, especially illegal immigration, has become a hot issue in recent weeks as Congress mulls a bill passed in the House of Representatives last year that includes provisions to criminalise illegal immigrants and bolster border security. A bipartisan Senate bill, currently stalled, would provide illegal immigrants a path toward citizenship and a guest-worker programme long favoured by President George W Bush. But there is some way to go before the competing bills are reconciled and a compromise reached. A number of US politicians say illegal migrants should be sent home. On 1 May more than a million US immigrants boycotted work or school and avoided spending money as a way of showing their worth to the economy. About 11.5m illegal immigrants live in the US, many of them of Latino origin.